For years, security and operations pros have loathed being involved in a compliance effort. And for good reason—compliance is long and tedious and pulls you away from the “real work” of securing your cloud environments. Join us for this webcast to learn how to incorporate automation to alleviate the hard work of compliance testing and produce automated results that will satisfy Ops and GRC. The demand for security professionals who analyze cloud risk and security has never been greater! Traditional approaches are no longer as effective and require new cloud security tools and technologies to become more productive. In order to build secure applications faster, security and compliance measures must be enforced at the speed of scale. Automation is essential for Modern IT organizations. The future looks bright for DevOps as new Cloud Security platforms, automation, and self-service tools fill the gaps to overcome key challenges and bottlenecks, delivering Continuous Compliance. The ability to provision and update infrastructure using APIs also allows flexible and programmatic control of our security choices. These decisions will ultimately help protect intellectual data, content, applications, systems and networks ‘in’ the cloud. In this webcast, John Martinez will lead a deep dive discussion and provide a live demonstration of how to improve security awareness between IT, Dev, and Ops teams, as well as provide some real-world (code) examples on how to bring security into your application delivery model to reduce risks with DevOps integration and security and compliance automation. John Martinez, Principal Solutions Architect for Evident.io, has in-depth experience guiding development teams on AWS and other cloud platforms. He assists them in streamlining creation of cloud applications, optimizing AWS resource usage, and ensures that their AWS infrastructures are properly protected. John specializes in DevOps, automation and continuous solutions, and contributed to the creation of the CIS Foundations Benchmark for AWS Security. Recently the Center for Internet Security (CIS) published the CIS AWS Foundations Benchmark, the first ever set of security configuration best practices for Amazon Web Services (AWS), and the first that CIS has issued for an individual cloud service provider. These industry-accepted best practices go beyond the high-level security guidance already available by providing AWS users with clear, step-by-step implementation and assessment procedures. CIS Benchmarks have been the de facto standard for prescriptive, industry-accepted best practices for securely configuring traditional IT components. The release of the CIS AWS Foundations Benchmark into this existing ecosystem marks one of many milestones for the maturation of the cloud and its suitability for sensitive and regulated workloads. Adam Montville is the Sr. Director for Security Controls and Automation at The Center for Internet Security (CIS). Tim Sandage is a Senior Risk & Compliance Strategist for Amazon Web Services (AWS). Tim Prendergast, CEO and co-foundeder of Evident.io who also led technology teams at Adobe, Ingenuity, Ticketmaster, and McAfee. These top ten were put together by AWS security practitioners with over a decade of combined experience securing large AWS deployments. Attendees will discover how most of these best practices are very easy to implement and go a very long way to ensuring your success on AWS. Join Evident.io's John Robel, Principal Solutions Architect, and 2nd Watch's Kevin Dillon, Solution Architect, for a review of the Top Ten AWS Security Best Practices. John Robel is a Principle Solutions Architect for Evident.io with over 20 years experience, and his previous role was as a Senior Technical Account Manager at AWS where he managed customer relationships with some of the largest AWS enterprise customers like Netflix and Adobe. John is an AWS Certified Solutions Architect and has been both Cisco Certified as a Network Associate and ITIL Foundation certified. Kevin Dillon is a Solutions Architect with 2nd Watch and has over 20 years’ experience building and managing high-performing teams with extensive industry experience with hedge funds and asset management firms. Kevin lives in the New York city area. Increasingly, security and risk (S&R) professionals must be able to securely migrate workloads to cloud providers like AWS. However, properly securing IaaS platforms involves much more than simply migrating physical servers to virtual instances. Today's dev teams are building cloud-native applications using IaaS services and APIs into which host-based security tools and network scanners have little to no visibility. To successfully defend IaaS infrastructure, S&R pros need to understand the security implications of Infrastructure as Code and and the importance of protecting the IaaS console and management plane. We’re now seeing a new “marriage” of SecOps and DevOps that is creating a whole new mentality for driving innovation inside and outside of organizations. DevOps and security teams are now actively collaborating as peers, rather than in the traditional requester/approver relationship, and making a seat at the table for security professionals. DevSecOps is propelling forward-thinking organizations by doing something simple - fostering collaboration of seemingly contradictory teams to align their disparate goals into a singular effort. Watch this recorded webcast to learn how leading DevSecOps organizations are bringing operations, engineering and security together to harmoniously detect security problems sooner, respond faster, and protect resources more effectively. As organizations move more deeply into continuous development and deployment modalities, the importance of implementing continuous security behaviors becomes non-negotiable. Cloud environments undergo dramatic changes during deployments, auto-scaling events, and through natural growth. While static data center environments were simple enough to be evaluated by humans, the dynamic nature of cloud environments are too complex to adequately secure without automation. Your operational tools deliver continuous monitoring and alerting — why doesn’t your security suite? Join DevOps.com Editor-in-Chief Alan Shimel, Andrew Storms, Vice President of Security Services at New Context, and Evident.io cofounder and CEO Tim Prendergast as they discuss why DevOps shops need to automate key functions in order to ensure their Cloud Infrastructure Security. There is no single path to a DevOps approach that works for every organization, but there are fundamental principles and techniques used by the DevOps elite that can be applied to improve security operations and efficiency in the cloud. This webcast summarizes the results of a new SANS survey that examines organizational use of public and private clouds and seeks to determine their best practices in securing content that traverses through both ecosystems. Security incident disclosures and vulnerability warnings are being released at an alarming rate, posing a major challenge for Security & Risk (S&R) Professionals. Additionally, firms that adopt virtualized and public cloud infrastructure like AWS are quickly finding that their traditional vulnerability management solutions and processes were not designed for these dynamic, elastic, and API-services centric architectures. An April, 2015 Forrester Research, Inc. report entitled “Market Overview: Vulnerability Management” stated that the vulnerability management technology space has evolved and will help " S&R Pros repair their strained or broken processes and move past low-impact checkbox scanning to proactive, risk-based assessments." * The state of vulnerability management and why Forrester recently said "security and risk pros can't keep up with the tsunami of vulnerabilities." Learn how to leverage AWS capabilities better to operate more securely and safely in the cloud. In a recent talk at AWS Pop-up Loft in San Francisco, John Martinez highlights the top 10 security best practices compiled from both AWS and Security practitioners over several years protecting large-scale AWS deployments. You will come away with actionable steps that you can implement right away to help ensure your success on AWS… and discover most of these controls are very easy to implement. Richard Stiennon, Chief Research Officer at IT Harvest, sits down with Tim Prendergast, CEO and co-founder of Evident.io, to talk public cloud security and compliance and why an automated DevOps style approach is now required to keep up with the velocity of change in public cloud deployments. 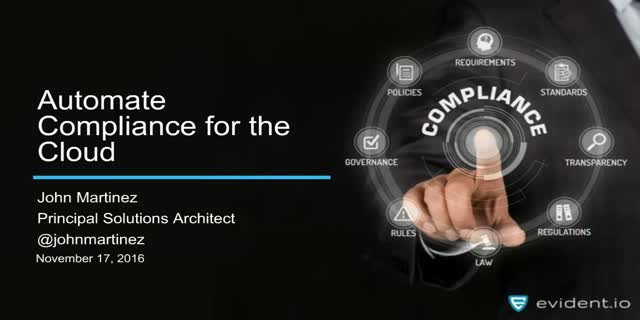 DevOps and Compliance are two very different worlds. If your company is going to achieve attestation or certification, it's usually the DevOps side of the house that has to give in. -how to use DevOps and automation to your advantage in an audit. AWS Identity and Access Management is an great feature for providing access to AWS resources - but how do you manage those rights well? What do you do when you are woken up from sleep for a security incident in your AWS environment? In this session John Robel, Principal Solutions Architect at Evident.io, will discuss the unique challenges to responding to security incidents, how to leverage AWS support and share advice on where to get help. You run a web business on AWS and you have a need to perform payment processing due to your specific business requirements. Whether you are selling subscriptions or shipping goods, there are both easy and hard ways to manage payments in a PCI compliant way. In this video you will learn techniques and controls to address 12 key areas in PCI on AWS without making your life more difficult than necessary. The Evident.io BrightTalk channel provides the latest trends, insights, and best practices for securing and achieving compliance for AWS-based cloud deployments. Evident.io provides continuous security monitoring and threat management for AWS environments. Evident Security Platform continuously assesses risk levels and vulnerabilities across your entire AWS footprint and provides expert remediation guidance – all manageable from a single dashboard. Built on AWS APIs, ESP is agent-less and can be deployed to even the most complex environments in minutes.